Wrapping the ARTS3091 Advanced Media Issues up in a nice little box and tying the ribbon or shoving all the content into the proverbial nutshell is virtually impossible without avoiding making generalisations and unsupported statements. However, what I am able to do is make a conclusive determination as to what I have learnt, how my knowledge has been extended as to the relationship between new media, culture and social change and my perception of the impact that issues in media have in our everyday lives. In looking at the how new media has influenced cultural and social change the role of transversals in allowing aspects of life like music, journalism, politics, science and education to develop “new lines that cross between older disciplines, older fields, older cultural practices” accounts for how the relationship between technological change and new media is shaping the future we will live in. Likewise, the data-driven society we live in that has been created by our ever-increasing usage of mobile media (Twitter and Facebook), online databases and access to openness in government data-sharing websites; is evidence of how new media is inspiring social and cultural change. Thus, I am able to conclude that participating in the Arts3091 course has given me an awareness of just how much technogical advances, new media and issues within the media have shaped the society and culture we live in now; as well as our future existence. What do you think about when your read the words: open science? It’s a funny term, sounds like a trick question doesn’t it? Open science is essentially where scientific information is easy accessible to citizens and is made relevant by the inherent links science has with culture and the media; particularly the manifestation created between these three elements of life. The television program ‘Why is it so?’ was a new way for science to be made available to children, through a new past-time based on the biggest thing in media at the time; television. Children were exposed to a scientific education in the comfort of the homes, in an interesting manner and different to what they had experienced this before. Thus, this was ‘open science’ in its origin as science combined with the media and culture to evolve into a more accessible form of its former self; like a tadpole to a frog or caterpillar into a butterfly. Organisation in our modern regulated 21st Century world is seen as a good thing, a positive step toward success – kind of like a socio-economic-political colonization that while suppressing our individuality results in a greater good because apparently collaboration is what achieves results. Despite the belief in teamwork and collaboration that extends from our human history of politics, military feats and sporting success, organisation stifles creativity, spontaneity and the inevitable consequence/product from happening. Yet is essential in applying the necessary scrutinty to our works and ideas. Politics has been reformed, maybe not enough to some, or in the wrong way to others but nonetheless it has been reformed through the transversal affordances provided my technological advances that had created new media; like Twitter and Facebook. In fact this renaissance of interest in politics has resulted in it becoming ‘alive’ again in the 21st Century, through the 24/7 scrutiny and limelight that is created by the impact of new media. This quote in its entirety demonstrates why social media has been adopted as an avenue by politicians to reach a different audience, or provided their intended audience/constituents with constant updates on what they are doing. 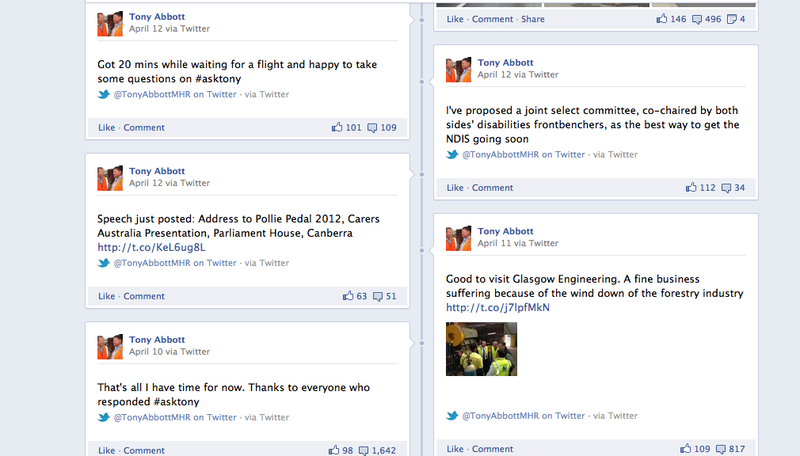 If we look at the example of Federal Opposition Leader & Warringah MP Tony Abbott MHR, whose tweets are fed directly through to his Facebook (see image 1 &2 below), he uses his twitter to communicate directly with voters whilst waiting in the airport terminal or when on his way home from a public event. An example of how politics has had their blinkers to the public removed or reduced as they are more accessible through their communication; no longer viewed as sitting down in Canberra out of touch. 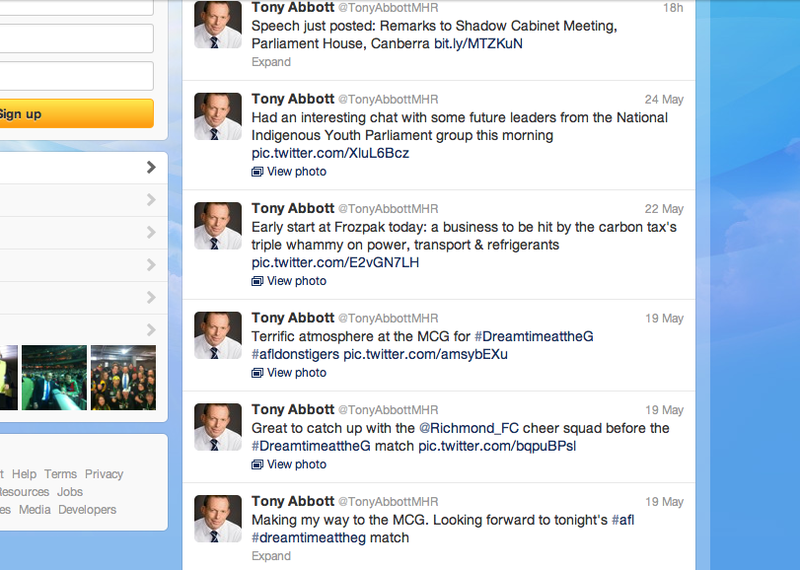 However, what is more evident in the adoption of twitter, Facebook and other social media sites, with Kevin Rudd the first Federal Leader to have a social media page on Myspace.com (created in 2006) is that as Phelps discusses technological advances and new media have provided a “…truly new and surprising way to tell stories”. Therefore, a transversal is created as the political atmosphere or even politics is reformed as “new lines cross between older disciplines, older fields, older cultural practices”. Finally, Sawers’ argues that, “there are some ways in which we massively overstate the impact of social media – and Twitter in particular” with the investigation into MP’s expenses in the UK and into Wikileaks having “…a significant digital element and were stories of the digital age; but they weren’t social media generated stories.” This demonstrates how politics through social media, particularly Twitter and Facebook, is demonstrative of transversality’s effect on politics through the affordances of new media, previously confined to print, radio and television, is allowing “new lines to cross older disciplines and older fields”. If you’ve ever watched the Australian Broadcasting Corporation’s Q&A or visited their Twitter page you would know what I’m talking about, the at home audience are able to tweet panelists/politicians directly and politicians not on the program tweeting about the show or responding to audience tweets. Week 6: Are you data-driven? Data. It controls our life, whether we like it or not data is what drives our lives, through its impact on the economy, society, politics and particularly technology. Yet you are still asking why data? Data has been around since humans have been able to archive information but what has changed the game is the fact data can now be gathered, recorded and published almost instantaneously through web-based technology; which through wireless or mobile devices has changed the way we live. Don’t believe me? Next time you are home on a friday or saturday night watch you Facebook News Feed carefully and see what establishments you’re friends are checking into, how many people have checked in that night and how many people like that Facebook page. If you then go to a site like eatability.com.au its more than likely that establishment will have a high rating. However, its highly probable you may have already been to the venue without checking an online rating because your perceived view about a ‘good’ or ‘cool’ venue will have already been influenced by looking at who checks in and the photos published from the event. This would allow parents to make an educated decision about where they send their kids to school based on the data recorded and obtained. In Australia the Federal Government’s my school.edu.au website does the same thing by making overall NAPLAN scores for schools accessible to parents, teachers, educators and other stakeholders. Finally, if you still think you may not be what I like to call “LUI” or living under the influence of data lets look at another example of data’s impact on our everyday lives, Gary Wolf documents Ben Lipkowitz’s 2005 purchase of a electronic datebook “…on a trip to Tokyo on May 11, 2005, which he started using to keep a record of his actions. Instead of entering his future appointments, he entered his past activities, creating a remarkably complete account of his life. In one sense this was just a normal personal journal, albeit in a digital format and unusually detailed. But the format and detail made all the difference. Lipkowitz eventually transferred the data to his computer, and now, using a few keyboard commands, he can call up his history”. Which is what Facebook’s implementation of the Timeline, implemented on 24 January 2012, has done for us by chronologically ordering the content on our individual Facebook pages that collates the data and segments the information. Furthermore, if you don’t perceive that the information on your Facebook is valuable, on the 24th of January Facebook advise users they would have “7 days to preview what’s there now. Giving you a chance to add or hide whatever you want before anyone else sees it”. Moral of the story anything that gives information or can be scrutinised to reach a conclusion is data, and if you go back and delete things of your Facebook, or make a decision based on online statistics: YOU”VE BEEN DRIVEN BY DATA! It’s a question I can’t answer, you most probably can’t answer, which most academics can’t even answer, so why ask it? Isn’t it absolutely vital for us to determine what we believe is real? I mean surely we can’t live our lives without considering the very questions that daily living, in all its various forms and outcomes, proposes? Okay! I’m done with posing the questions. However, while I’m not able to explain what is definitely real, I can tell you why it is important we have a go at answering the unanswerable question. Real is what you perceive to be important to both YOU and OTHERS around you, it may be based on events that intertwine your/their lives or it may be events that have some impact on you both; whether it be hearing you aunty died in a car accident on the news or that your insurance company has gone bankrupt and you are no longer insured. To some real or reality consists of the future possibilities and potential of the human race regarding our own human ability or technological advances like those that are alluded to in the videos made by about drones and Quadcopters(http://www.youtube.com/watch?v=MvRTALJp8DM&feature=player_embedded). Yet something is amiss. Is it necessary to define and determine what is real? What is the point? Let us take the example of the brain-game where the more relaxed the participant is the further the ball travels down the field toward the other person’s “endzone”; whereby the less stressed wins. How REAListic is that? When I’m playing in SuperBowl LIII online against some dweeb in north Carolina, who is level 20 and me at just 7, an its 4th quarter with 1:17 on the clock, I’m down by 4 points and need a touchdown. I’m going to be stressed to the point of swearing and I still may win. Further, when I’m sniping out Al-Bashir’s private guard, in Battlefield 3, while being shot at by counter-snipers and I’m playing on Legendary mode with auto-aim off; I’m going to be stressed because that is a real reaction, based on the reality of the situation I’m in and the outcome I wish to occur. Therefore, this leads me to the conclusion that maybe its great to not know the real in our lives, have a little faith in our own beliefs of what is real which might be religion or that aliens live among us, whatever it may be just as long as we are conscious of what is important to us as individuals. Having out lives mapped out around us, like what is shown in the Augmented City 3D video, is certainly something I don’t want because forgetting things and engaging with media or technology when I choose to is real. As then I become responsible or conscious for the decisions I make, sure you can contest this view, but at the end of the day you can’t control what I believe; is real because real is what we all individually believe to be true. Week 4 – Our Media Addiction Is Embodied: Worse Still It’s Cognitively! As a twenty-year-old student, even more so a media student, in the year 2012 media and society’s increasing dependence on the various mediums certainly leads to one conclusion. Our demand or craving like need for media has lead to our addiction to media being embodied within us. In the video above, we see ESPN’s coverage of the NFL’s 2009 ban on the access of twitter during team meetings, practice days/sessions and within the 90 minutes preceding a game and 60 minutes following a game. Which in context with our word of the week embodied demonstrates a negative impact of the embodying of our media addiction that stems from our feelings/perceptions and wanting to know as much about every detail as possible, however, the video also infers the negative impact on athletes where they have become dependent on tweeting to maintain their celebrity status amongst NFL and sports fans. Although even this negative view on our embodied demand for media is contextualized by Murphie’s statement that “…cognitivism’s increasing ability to micro-manage cultural activities (education is one major example) creates a self-fulfilling prophecy in which “cognition” as a concept is almost indispensable.”  Begging the question: do our cognitive processes, conscious or subconscious, effect our embodied demand for media consumption or are we merely readily accepting the almost required adoption of media and technology that characterises this 21st Century we live in?